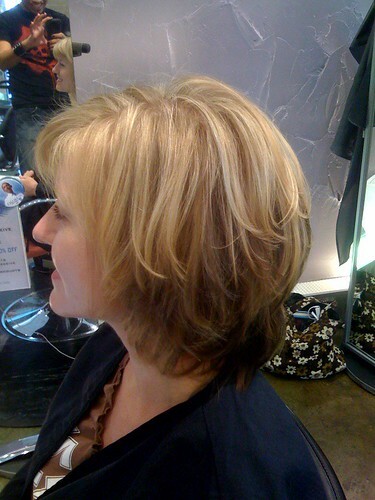 Hair Obsessed: Cute short layered hairstyle with great blond highlights. Cute short layered hairstyle with great blond highlights. hair model, a photo by trixieskips on Flickr. I get my hair done at Zen Salon in Oak Lawn. When I was getting my goldilocks trimmed last week, my stylist Yuen asked me to come in today to be a hair model. HELL YES! I got what she calls sunset foil highlights. The under part of my hair is two shades darker brown. The middle is light blonde and that brown alternating, and the top is all light blonde. I love that place. And I love my hair! More pics to come, they say, including some of me looking like a robot.